As time progresses, with major developments like Vizhinjam and Technocity reaching their full potential and demand for public transit building up on key corridors, further monorail routes will become viable. For example, some of the existing high-capacity bus routes described earlier would need to be upgraded and integrated into a third monorail line that starts at Balaramapuram, first heads West to Vizhinjam and then runs via Kovalam-Eachakkal-T3-Kochuveli(along the Veli Road)-Veli-Aakulam-KIMS-Medical College campus-Pattom-Kowdiar-Peroorkada-Civil Station-Mananthala-Vembayam. This line will be between 35-40 Km long and cost about Rs 5500-6000 Crores. At this stage, Trivandrum's monorail network will be approximately 110 Km long and cost slightly under Rs 15,000 Crores. Another option would be to curtail the line to Vizhinjam at one end and Vattapara at the other, which would reduce the length to about 30 Km and the cost to about Rs 4000 Crores. At this stage, the core MRTS network by itself would provide connectivity between almost every key activity and transportation node - Technopark, Technocity, Vizhinjam, both main railway stations, Airport, ISRO, the city center and the educational centers, as well as to key catchments within the city and in the key suburbs and satellite urban area. This means that a significant portion of the expected 500,000-plus commuters in the Trivandrum metro area by 2018-20 will be have access to the system, ensuring high levels of ridership. While the monorail system and its associated bus services will be capable of handling commuter traffic within the core of the metro area, tens of thousands of people commute daily to and from Trivandrum from as far afield as Kollam and Nagercoil. Currently, most of them spend upwards of two hours on crowded buses and passenger/long distance train. An efficient and effective travel solution for this demand not only improves the quality of life of thousands of people but also expands the catchment of employers and educational institutions in the Trivandrum metro area to a region almost 150 Km across and with a population approaching 10 Million people. 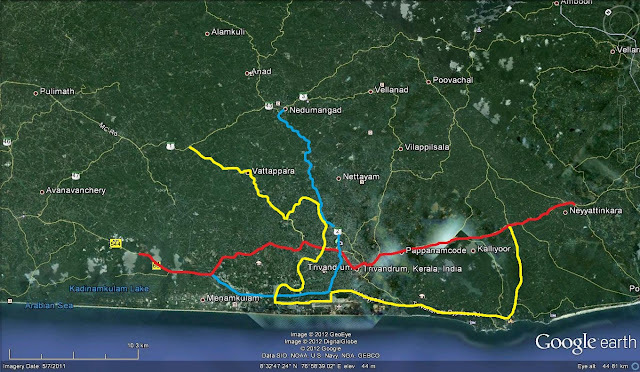 At present, the regional connectivity for this vast area consists primarily of the NH 66, the M.C.Road and the Kollam-Nagercoil mainline railway. Only low-capacity bus services operate at present on the two arterial roads and passenger/long distance trains on the rail line. The obvious solution seems to be the introduction of commuter rail services linking Kollam and Nagercoil to Trivandrum. It is estimated that over 50-60,000 people commute to Trivandrum daily from Kollam and Neyyatinkara, and places in between. If the scope is extended to Nagercoil and thinking out to 2015 when a commuter rail and monorail system could be made operational, we could be looking at 100,000 people a day in either direction. With the 65 Km Kollam-Trivandrum stretch taking about 90 minutes and the 30 Km Trivandrum - Nagercoil stretch taking about 50-60 minutes, 20 rakes would be needed to maintain a 15 minute frequency during the peak periods between 6.30 AM and 8.30 AM and 4.30 PM and 6.30 PM. Off-peak frequencies can be every 30 minutes to start with. The basic reason that the MEMU has remained on paper is the desperate lack of resources with the Railways to acquire the rakes needed. 20 rakes of 6 coaches each would cost between Rs 300-360 Crores. In cities like Mumbai and Hyderabad, the State Government bears a significant part or even a majority of the acquisition cost of the rakes as well as shares in any system related expenses. With a MEMU shed already available at Kollam, the latter would probably involve minor improvements to platforms, upgradation of some of the smaller stations along the route and the establishment of a second MEMU maintenance facility, potentially at Nemom. Services on the Kollam-Trivandrum stretch should terminate at Nemom and those on the Trivandrum-Nagercoil stretch would terminate at Kochuveli, allowing the heavily congested Trivandrum Central to act only as a pass-through station with two platforms dedicated to commuter rail services. The commuter rail could interconnect with the monorail at Kaniyapuram / Kazhakkoottam (via Skywalk), Kochuveli, Trivandrum Central and Neyyatinkara (potentially via Skywalk). The Railways has completed the survey for a new line between Erumeli and Trivandrum via Pathanamthitta and Punalur. It's expected to loop to the east of the core city area and meet the North-South mainline at Nemom. Commuter rail services can be run on this line as well up to Punalur with peak frequencies of 30 minutes, requiring another 4-6 rakes. Concurrently, and working in a joint funding model, the State could work with the Railways to add a third and a fourth track to the mainline between Trivandrum and Kollam, with the two new lines capable of supporting high speed train services as previously discussed. In short, commuter rail services will help to extend the mass transit catchment of Trivandrum all the way to Kollam and Nagercoil, and thus benefit as many as 10 Million people in and around Trivandrum, helping to create an extended metropolitan area roughly the size of Chicago. It will help to extend the metro area further and help integrate the two cities closer with the regional center of activity. These services will also significantly de-congest the NH-66 and the MC Road. Once more, the need for integrated planning becomes evident since the commuter rail system needs not just trains and tracks but effective links with other transit systems to succeed. For example, the alignment of the monorail network as well as the design of some key stations may have to be finalized keeping in view the need to maximize direct monorail-commuter rail interchanges. If the monorail and commuter rail stations are too far apart, the percentage of inter-modal use would start to fall off. With effective integration, the 100,000 or more commuters using commuter rail daily would almost all also use the monorail system to complete their journeys. Now that we have commuter rail out of the way, let's also cast a brief glance on a less obvious but no less potentially useful form of mass transit in the Trivandrum metro area, one that uses a natural pathway - water. Kerala is well known for its water transport, having utilized its extensive system of backwater lagoons, lakes, rivers and inland waterways for hundreds of years for moving people and cargo. 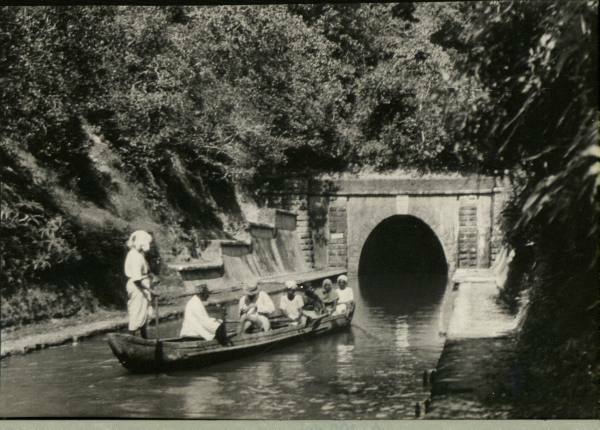 The Kings of Travancore were at the fore-front of water transport, and engineered water transport at that, by not-so-minor feats of construction such as the Parvathy Puthanar canal, which includes what are probably the only cargo waterway tunnels in India. Needless to say, this proud canal system has fallen into disuse and all the State's horses, departments and dredgers have not managed to resurrect it till now despite multiple projects intended to clean out and operationalize the canal. 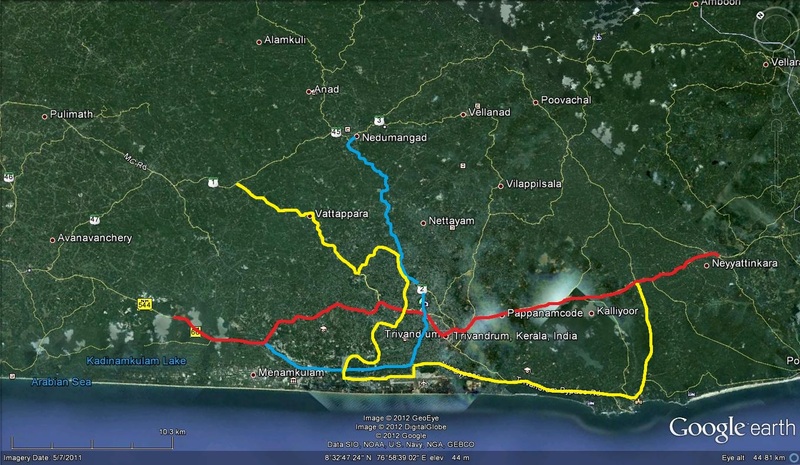 The bulk of the waterway development has been concentrated on the Kollam-Kottapuram stretch of the so-called National Waterway III (as in many, many Crores spent but nothing much achieved). Preciously little has been done about the Kovalam-Kollam stretch despite many an announcement in the past few years. Systematic encroachment of the canal is one major hurdle which needs to be overcome before it can accommodate traffic. 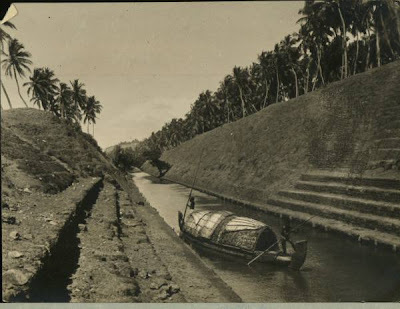 This can be achieved as can be the need to dredge the length of the canal to reach an adequate operating draft, with enough effort and money, neither of which are in particularly short supply especially in view of New Delhi's interest in developing inland waterways through the Inland Waterway Authority of India. The IWAI has commissioned exhaustive research on the development of the Kollam-Kovalam stretch as well as for the Poovar - Colachel stretch (I didn't even know this existed!). Unfortunately, none of this is publicly available and little traction seems to have been achieved despite the enormous potential of the route because projects with an investment upwards of Rs 30,000 Crores - Technocity, Technopark, VSSC, Trivandrum International Airport and the Vizhinjam port - are all located along it. The truth of the matter is that development of water transport has been lagging in part because of the absence of a clear demand pull despite frequent and loud discussions about the potential of inland cruise tourism and cargo movement. 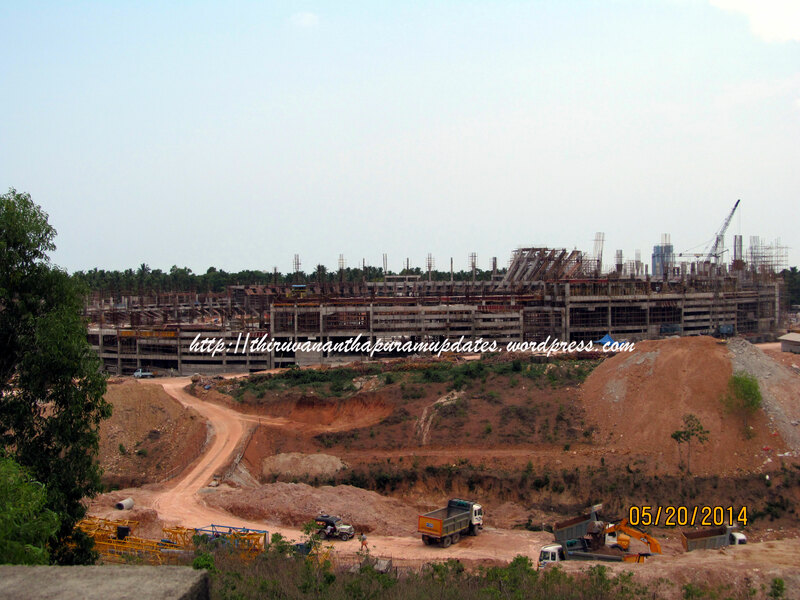 National Waterway III from Kottapuram to Kollam has seen only limited cargo movement even after being in development for over a decade and after expending hundreds of Crores. This in turn is due to the fact that neither passengers nor cargo are likely to take a different mode of transport unless there is no other alternative (as in parts of Kuttanad, for example) or (when trying to divert road/rail traffic on to water), it is significantly cheaper or faster. 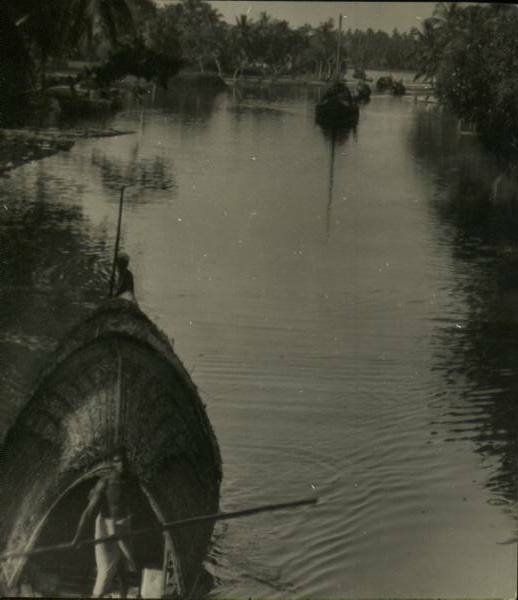 Water transport, as a whole, tends to be cheaper due to scale economies and the low cost of the transportation medium itself, as opposed to roads or rails which need constant maintenance. The key question is whether it would be faster. In the case of passenger transport on inland waterways, the answer is probably no considering the relative narrowness of the canals and the large number of bridges along the way (unless you have the skills and gadgets of 007 in Moonraker!). 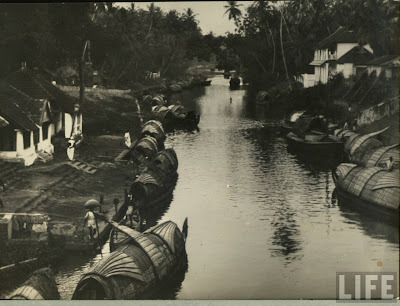 On average, canal boats could probably achieve 40 Km/hr and for select destinations like Chirayinkeezhu and Varkala town, which are closer to the canal than the NH 66, this could make sense for commuting to and from Trivandrum. The real attraction could be for cargo transport to and from Vizhinjam, although this would need significant expansion of the tunnels at Varkala. The real potential for water transportation could lie along the coast where fast catamaran ferries can meet and beat the average speed of road/rail transport between key destinations such as Trivandrum, Varkala, Kollam and Colachel. These fast twin-hulled ships are widely used around the world to provide coastal and inland transit services, including here in Boston. Large catamaran ferries are fast, comfortable and can operate in pretty much all weather conditions. During off-peak hours and on holidays, they could be used for tourism and leisure activities, which will be a boon to the tourism sector. Trivandrum has a ready-made ferry terminal already in the form of the Valiathura sea pier that was once Kerala's busiest port but has now been reduced to a dilapidated relic by decades of administrative neglect and the abject denial of the obvious fact that the pier continues to have great tourism potential. If renovated, at a relatively small cost, the sea-pier can become a world-class ferry terminal, given its natural draft and its extreme proximity to the city center, the International Airport, Kochuveli railway terminal and the NH 66. Catamarans can cruise at 70-80 Km/hr, reaching Kollam (Thankasseri port) in less than an hour from Trivandrum and can be operated on a PPP basis at costs comparable to other modes of public transit. At the top of the list is the NH 66 from Kazhakkoottam to Karode, whose four-laning has been delayed for various reasons - mostly the lack of political will - for over a decade now, even as the road itself exceeds the traffic threshold for six-laning! With Technocity, Technopark, VSSC, multiple industrial parks, the International Airport, Kochuveli rail terminal, Kovalam and Vizhinjam port all located along a 30 Km stretch of the road, it is by far the most critical piece of pending road development in Kerala. Fortunately, at long last, the project is moving forward with land acquisition for the part of the road not already acquired having commenced a few days ago. Dr Shashi Tharoor played a crucial role in persuading the Ministry of Highways to proceed with the strategic road even as other stretches of NH 66 continue to be plagued by the "45 m-or-not-45 m" debate. Work on expanding the desperately congested road to four-lanes is expected to begin later this year at a cost of Rs 800 Crores. One hopes that saner minds at NHAI will sanction a concurrent six-laning because the Kazhakkoottam-Vizhinjam stretch has already breached the traffic volumes that call for it. Next in line is the widening of the equally grid-locked Karamana-Kaliyakavila road, the old alignment of the NH 66. This is currently at the mercy of the State Government, the previous edition of which had proposed a Rs 640 Crore project, but the current administration has not yet allotted even the funds needed for acquiring the land for the project (the Center had earlier sanctioned some funds). The project is facing the usual alignment and land acquisition protests but should be completed with the highest priority. Despite a skimpy 30.2 m width, there is the chance that it could be developed with 6 lanes and should definitely be built according to international standards like the TCRIP roads. Finally, to close out the list of priority regional roads are the MC Road and the proposed Outer Ring Road (ORR). The former has already received a healthy make-over under KSTP but needs to be widened to a full 4-lanes at least till Anchal/Punalur before development solidifies on either side. The latter was proposed under Phase VII of the National Highway Development Program and although NHAI called for consultants to prepare a detailed report, nothing has been heard of it since. This needs to be immediately pulled out of cold storage and put into construction, since land acquisition will progressively get more difficult as the Eastern fringes of the city get more densely populated. Running from Attingal/Kaniyapuram to Venjarammoodu to Nedumangad to Malayinkeezhu and then terminating at Neyyatinkara, the ORR would be upwards of 60 Km long and cost upwards of Rs 1200 Crores. Together with mass transit lines proposed earlier in the article, this road would help speed up the development of these areas and make the city's rapid growth more equitable and efficient. Between the mass transit system, the NH 66, the MC Road and the ORR, most of the main traffic axes are covered but these need to be supported by an efficient system of secondary corridors - most likely roads with high-capacity bus services. While TCRIP has helped establish an effective set of roads within the Corporation area, the same needs to be replicated on a metropolitan area-wide basis. Roads like Sasthamangalam - Vattiyoorkavu - Aruvikkara - Peyad, Peroorkada - Karakulam - Nedumangad - Vithura, Peroorkada - Civil Station - Mananthala - Sreekariyam, Kovalam - Vizhinjam - Poovar and so on need to be developed concurrently to 4/6 lane widths (not 2/3 lanes as many TCRIP roads were, only to be found wanting as soon as they were ready). Many of these would need to be widened before monorail lines are built along their medians. Inner city roads like Medical College - Kumarapuram - Nalumukke, Paruthipara - Muttada - Ambalamukke, Sasthamangalam - Pangode - Jagathy - Thampanoor, PMG - Pottakuzhi and so on also need to be developed to 4-lane width with medians, automatic signals, bus-bays, paved sidewalks and streetlights. Some of these have found mention in the current State Budget. A total of about 60 Km of roads that could cost about Rs 300 Crores. Equally importantly, all major secondary and tertiary city roads (read, 2 lanes and up) need to be fitted with sodium vapor lighting - starting with the 6-lane Kesavadasapuram-Pattom and Vellayambalam-Thycaud stretches which inexplicably continue to languish in darkness over a decade after being widened. Then there is always that usual member of road wish-lists put together by citizens' organizations in Trivandrum, the Kottur/Kallar - Ambasamudram Eastern highway assumes significance as it can reduce the distance to Tirunelveli and the vital NH-7 by over 70 Km. This will help to improve access from Central and Southwestern Tamilnadu to Vizhinjam when the deep-water port opens, helping to expand the hinterland that the port can make use of. More wide roads mean more traffic, volume-wise and complexity-wise. This calls for better designed intersections and more effective grade-separation. While it took several years for Kerala's first grade separator to be built in Trivandrum, it will be the first of many. Junctions like Kazhakkoottam, Technopark, Anamugham, Chackai, Eanchakkal, Pattom, Kesavadasapuram, Peroorkada, Mananthala, Vellayambalam, Killipalam, Balaramapuram and Kovalam have either already exceeded or will soon exceed the threshold traffic for the use of grade-separators as opposed to signals. Many of these need to be planned along with the monorail system so that there is no conflict later as in the case of the elevated approach road to the New International Terminal which now clashes with the widening of the NH-66. Whew! That was a lot of infrastructure development that we talked about, it's time we put a number to all those ideas and the whole concept of a metropolitan transportation plan and system. A Rupee number, of course. That's a lot, even though it pales in comparison with State's current champion white elephant, the Rs 160,000 Crore Trivandrum - Kasargode bullet train system. Moreover, this cost should be compared to the total life-time economic benefit that it will facilitate. Projects like Vizhinjam, Technopark expansion and Technocity bring in direct and indirect investments totaling over Rs 30,000 Crores and will help generate over 150,000 direct high end jobs in the coming years. Over a 30 year operating period, these projects will generate over Rs 200,000 Crores of direct economic benefit. However, without world-class infrastructure, such world-class projects can operate in an optimal fashion. This means that the investment in infrastructure is a direct input to the economic future of Trivandrum, Kerala and India (Vizhinjam, for example, brings competitive advantages to the entire country's economy). On the other hand, even if the transportation system saves 10 minutes a day in travel time for the estimated 500,000 commuters who will use it daily, that is nearly 10 man-years saved each and every day. A mere Rs 10 saving per day per person in travel costs results in Rs 200 Crores of savings a year. Unlike the proposed budget-breaking investment in bullet trains which may (or may not) benefit a small section of society and will have little or no direct economic benefits, the metropolitan transportation system benefits an entire population (500,000 people a day Vs a few thousand) and adds economic capacity in both promoting mass employment (by reducing the cost of employment that includes commuting costs) and by creating significant incremental cargo capacity (by de-congesting roads and adding new infrastructure). A) User Fees - Fares on each of the various transportation systems can be maximized with respect to what the market will support. For example, monorail fares can be bench-marked to a level between ordinary bus fares and Volvo fares. Commuter rail fares can be bench-marked to be lower than the comparable local passenger train tickets. B) Public Private Partnership - While it is unlikely that a pure BOT model will be viable in light of the high capital costs and the constraints on fee-based recovery, a version of the landlord model being used at Vizhinjam could bring in an efficient private sector operator that can maximize revenues from the transit system and pay back the operating costs as well as help the State meet the cost of capital through a revenue share. C) Tax-based Recovery - In initiatives, such as the development of mass transit systems, where the projects will create incremental economic development, some of this activity can be channeled through appropriate taxes and cesses back into funding the projects up front. Let's assume that a monorail line will promote new business parks that make Rs 10,000 Crores of new IT exports. At a taxation rate of 10%, this brings back Rs 1000 Crores to the Government. If we attribute 50% of this back to financing the monorail line, the contribution can help meet the debt service for a loan of Rs 5000 Crores over a 10 year period. This principle, called Tax Increment Financing(because it raises funds on the assumption that the project so financed would more or less directly increase tax incomes) is widely used in the US to finance urban infrastructure projects. A direct application would be to boost the Floor Area Ratios (FARs) for real estate development along monorail routes and around stations, and to charge a fee for the additional FAR. A fee of Rs 100/SF would be minor compared to the revenue/SF but would bring significant benefits to the developer in terms of access to its project. Over the built-up area envisaged in Technocity alone, this would yield Rs 600 Crores up-front. Additionally, real estate taxes on buildings along mass transit routes can be higher since these buildings tend to get higher rents than ones further away. These taxes are an annual income stream that can help finance the transport projects. D) Transit-Oriented Development - involves enabling high-density, mixed use, sustainable real estate development very close to mass transit stations. Real estate developers would pay up-front premiums or an annual lease for the space, which would help fund the system. However, this may be difficult in densely built-up parts of the inner city where land near stations is already developed. That said, stations on the fringes of the urban core like Pallipuram, Kaniyapuram, Nedumangad, Vembayam and so on are more suited for TOD in terms of availability of land. It is evident that putting together the funding for such a complex and capital-intensive initiative, let alone managing a massive project that will span 10-15 years and involve hundreds - if not thousands - of contracts, very sophisticated planning, maddening conflicts with existing infrastructure and with land-owners and so many things that cannot even be imagined right now is far beyond the capabilities of the motley crew of agencies that exist today. A MTA is the only solution, firstly to bring all the stake-holders under the same umbrella and then to build the competencies needed to manage the project and to put the money together. That's the very first step towards a world-class future for our favorite metro. As far as I know, very few Indian cities, perhaps with the exception of select metros such as Mumbai, have fully integrated transportation agencies. If Trivandrum can lead the way in establishing an MTA and an integrated metropolitan transportation project, there is no reason that it cannot be a true differentiator that sets Trivandrum apart from the dozen or so Tier II cities jostling to graduate into the big league. In private discussions with the senior management at several leading global firms looking at Trivandrum as an investment destination, this has been the single major lacuna identified in the city. No reason that transportation could not become our trump card, when it is the pain-point for the likes of Mumbai and Bangalore (no wonder that they are splurging tens of thousands of Crores on it!) and when Trivandrum's evident strengths - such as its world-class human resources, intellectual capital and strategic location - already give it an edge. As much as it seems like a challenge worthy of Hercules himself, it is also a massive opportunity. Let's get cracking!